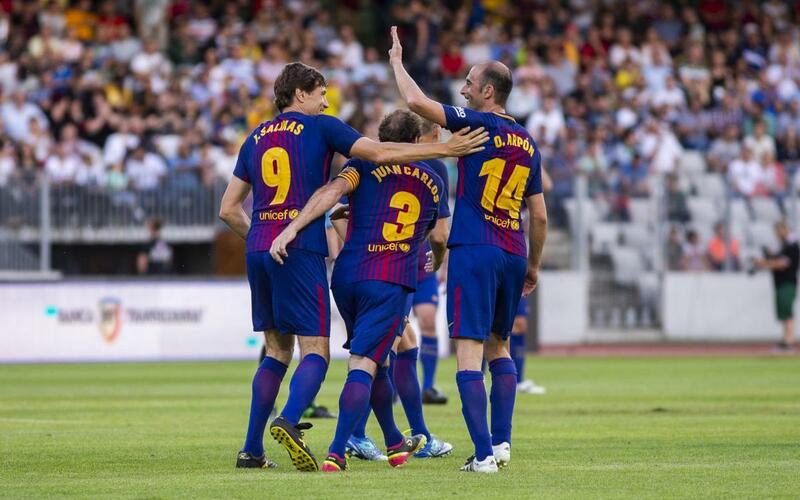 'Chapi’ Ferrer’s team won the Legends match against the Romanian side 0-2, thanks to goals from Salinas and Hagi. The match took place in Romania, at the Cluj Arena, a stadium with a capacity for 30 thousand spectators. Fans who came to watch marvelled at Julio Salinas' great finish in the last minutes of the first half. A pass into space left the Basque striker in on goal, and he made no mistake. After the break, Gica Hagi changed teams, meaning we were left with the iconic image of him wearing the Barça shirt in their home country. The midfielder showed signs of his quality and, in the 70th minute, his goal secured a 0-2 win.